using the new kind of propeller screw — "Die Schiffsschraube"
Before we starts with a recovery (screw’s propeller surface overhaul) . A very pure surface quality with sure a lot of energy losing by ship operation on that part only. There is not ONLY an engine performance that is responsible for the fuel consumption at a marine vessel (ship), but the hydrodynamical effects on a "screw propeler" as well, and that is exactly the problem, what we solving. With our new screw propeller recover service the saving of the energy on a propeller screw up to 10% is recorded — the fuel saving are up to 3 to 4% are possible. This equally simple and effective principle to improve the vessel’s power and speed. In contrast with conventional ship’s propeller, – the STORM’s propeller’s concept is equipped with less energy lost on a propellers rotating. The optimum matching of the system with phenomenal results in a considerable increase in efficiency and speed. The STORM’s Propeller is thus the successful optimization of the complete hydrodynamic system and ideally suited as a propulsion concept for all ships in the medium and high speed range with design–related higher propeller loads. This is because the STORM’s technology (SPT – the STORM’s Propeller Technology) reduces the load acting on each individual propeller by reducing the hydro–pressure power over the propellers, thereby increasing the efficiency. The SPT is equipped for a pull propeller and a push propeller. Contraction of the hydro–power stream in the pull propeller means that more water reaches the push propeller from the sides, which further enhances the performance. Moreover the strut is hydro–dynamically optimized and provided with a recovered propeller’s surface arrangement. 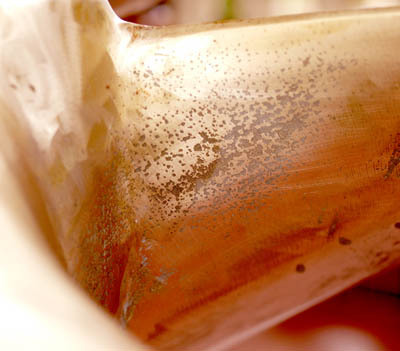 The swirl energy generated in the propeller stream is thus recovered, leading to an increase in efficiency or speed. The noise and vibration level is significantly reduced, too. 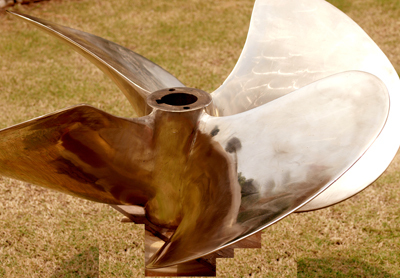 — Distribution of the power to recovered propeller’s surface results in a low propeller load. — Recovery of the swirl losses of the pull propeller by means of the specially created hydro–dynamically optimized propeller’s surface. Proven power transmission, as there is less or no additional gearbox power needed. sealing package are saved. Lower mechanical losses of the propeller–engine systems.